approach under these circumstances, the concept of weakly-structured workflows has been developed. itself to be used as a valuable resource in knowledge management. The FRODO TaskMan is a demonstrator for this concept of weakly structured workflows. It is an agent-based workflow management system integrated in organizational memory information systems. The TaskMan was developed within the FRODO project at the DFKI Knowledge Management Department. 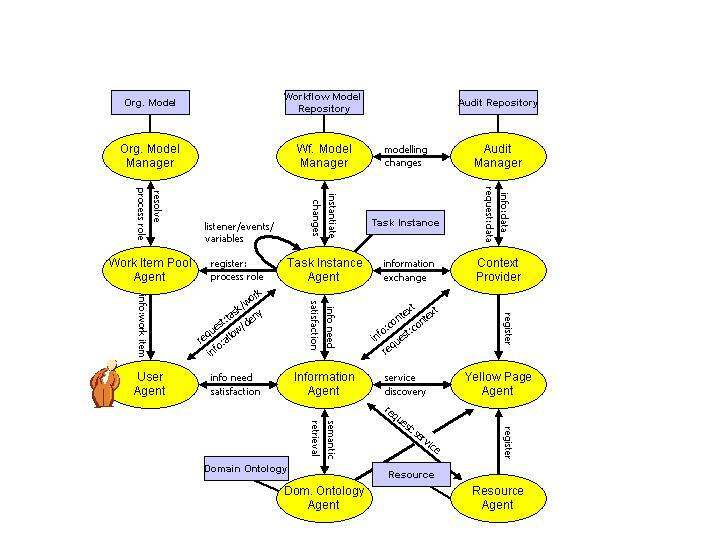 namely a flexible workflow approach (therefore agile) and the connection to business process-oriented knowledge management. 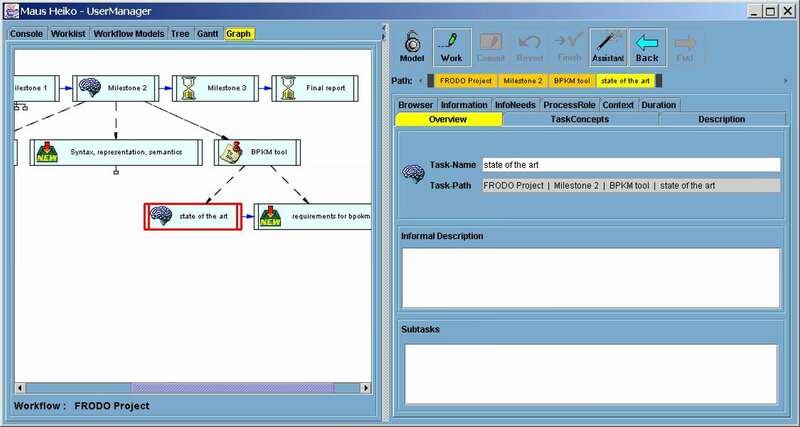 the task manager which allows to model and work on the task. We did an evaluation of the FRODO Taskman. We published the results in a paper and here you can find some pictures. The TaskNavigator is the web-based successor of the FRODO TaskMan. This is a presentation of the concept and the demonstrator (with screenshots) along the example of project managment as knowledge work. at the 8th International Conference on User Modeling, Sonthofen, Germany. FRODO: A Framework for Distributed Organizational Memories. Milestone M1: Requirements Analysis and System Architecture. Andreas Abecker, Ansgar. Bernardi, Ludger van Elst, Andreas Lauer, Heiko Maus, Sven Schwarz, and M. Sintek. DFKI Document D-01-01, DFKI GmbH, March 2001. Zeitschrift KI - Künstliche Intelligenz , Thema Wissensmanagement, 1/02, S. 5-11. Zeitschrift KI - Künstliche Intelligenz, 3/04, S. 59-61. In: Proceedings of I-KNOW '05 - Special Track on Business Process Oriented Knowledge Infrastructures (BPOKI). The FRODO TaskMan extends the approach taken in KnowMore. on traditional workflow systems (let's say according to WfMC) with strongly-structured workflows. There is no issue of flexibility on the workflow level. support of knowledge intensive tasks of the KnowMore-scenario. The FRODO TaskMan allows modification of the workflow during runtime (delete, add, modify tasks, change the control flow). Furthermore, detail tasks (by hierarchical decomposition) if needed. collaboratively work on processeses in a team and evolve process-know-how.